HKLM\SOFTWARE\Policies\Google => Key deleted successfully. You do not have the latest Java. Save it to your PC then close all browsers and install it. Do not let it install the yahoo toolbar or other foistware. I would dump Microsoft Security Essentials and install the free Avast. Be careful when downloading. They have started trying to get you to download Chrome and/or Google Toolbar so make sure you uncheck them first. C:\ProgramData\AVAST Software\Avast\report\aswBoot.txt but it might change so verify the location. When Windows loads Click on the Orange Ball then Maintenance then Scan Logs. Click on the Boot-time scan log and then View Results. If it found anything then open the saved Report and copy and paste the text into a reply so I can see it. Looks like Avast ran a lot quicker than it does on my PC. It did find a few items is I guess it was worth it. Computer seems to be running good now. I will run malwarebytes and spybot again to make sure that they run all the way through, since that was my first indication that something major was wrong. 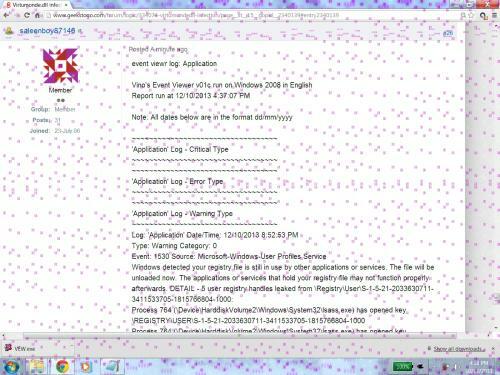 The only other thing that I have going on now is I have a bunch of little pink squares all over my screen. This wasn't the case last Sunday when I started looking at the computer. I am assuming a setting or a driver got messed up. I tried installing the lenova update software and the computer said I didn't have the administrative rights to do this. This is weird also because I know I had installed it previously on this computer, but I do not see it in the list of programs on the start menu. The pink dots are giving me headache, LOL. Otherwise thanks for all your help so far. update: If I use the search field on the start menu, I find the lenova updater, but when I try to run it, it says that "system update has detected a serious problem loading language files...."
Attach Screen.jpg to your Reply. Also: What make and model is the PC? Tried running the sfc /scnnow, got to 70% verification and stopped. Here is the log from next step. The driver \Driver\WUDFRd failed to load for the device USB\VID_0483&PID_2016\5&37c8a9dc&0&2. ibmpmsvc.exe	964 K	2,920 K	944	Lenovo Power Management Service	Lenovo. (Verified) LENOVO(JAPAN)LTD.
lvvsst.exe	1,400 K	4,536 K	3124	Auto Scroll Start Service	Lenovo Group Limited	(Verified) Lenovo(Japan)Ltd.
SCHTASK.EXE	2,384 K	4,876 K	4236	Power Manager Power Agenda	Lenovo Group Limited	(Verified) Lenovo(Japan)Ltd.
tphkload.exe	1,668 K	4,936 K	1788	ThinkPad Message Client Loader	Lenovo Group Limited	(Verified) Lenovo(Japan)Ltd.
TPHKSVC.exe	1,952 K	5,400 K	1952	On screen display Fn+Fx handler	Lenovo Group Limited	(Verified) Lenovo(Japan)Ltd.
TPONSCR.exe	2,048 K	6,028 K	2292	On screen display drawer	Lenovo Group Limited	(Verified) Lenovo(Japan)Ltd.
TpScrex.exe	2,220 K	5,456 K	2332	ThinkPad UltraZoom	Lenovo Group Limited	(Verified) Lenovo(Japan)Ltd.
upeksvr.exe	2,552 K	8,388 K	1764	Fingerprint Server Process for Vista	UPEK Inc.	(Verified) UPEK Inc.
TpShocks.exe	0.05	908 K	3,336 K	3896	ThinkVantage Active Protection System	Lenovo. (No signature was present in the subject) Lenovo. TPOSDSVC.exe	0.09	6,280 K	6,888 K	2200	On screen display message generator for ThinkPad	Lenovo Group Limited	(Verified) Lenovo(Japan)Ltd.
AppleMobileDeviceService.exe	0.13	2,612 K	8,228 K	2624	MobileDeviceService	Apple Inc.	(Verified) Apple Inc.
virtscrl.exe	0.83	1,656 K	5,496 K	3196	Lenovo Auto Scroll Utility	Lenovo Group Limited	(Verified) Lenovo(Japan)Ltd.
Looks like a bad video driver. If you boot into the Safe mode menu and choose the Low Resolution Video option do you get the pink spots? Turns out I need a 4 digit number to identify Your Lenovo exactly. Should be on a Lenovo sticker on the bottom of the laptop. Download, Save and right click on it and then Run As Admin. Download it and save it then run it by right clicking and Run As Admin.